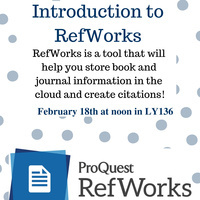 Learn how to use RefWorks, which is a tool that stores book and journal information in the cloud and also creates citations. Recommended for upper-level undergraduates, undergraduates, and anyone who collects journal articles and other sources for a literature review. Recommended for upper-level undergraduates, undergraduates, and anyone who collects journal articles and other sources for a literature review.